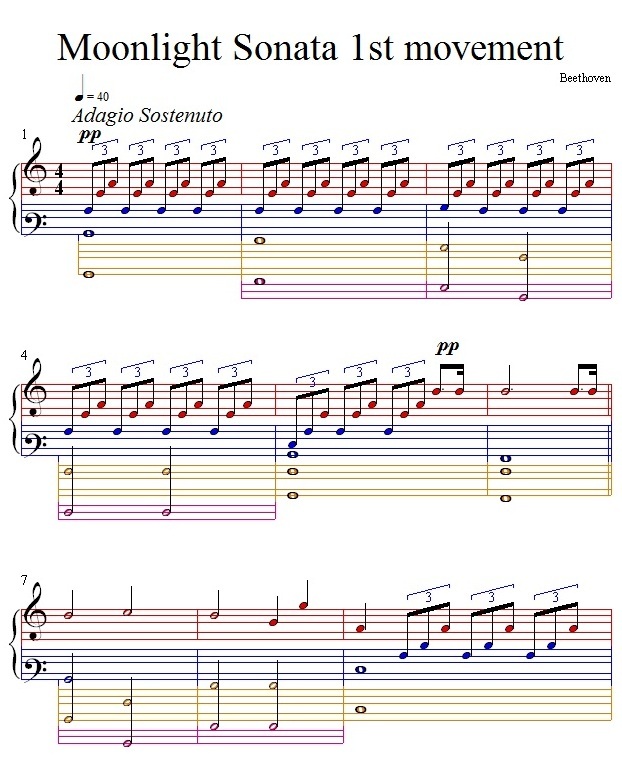 I purchased a book called 'Abrose Piano Tabs'. A newly created way of reading music. It's pure genius IMO. Here is a link to their website - lot's of free stuff too. The creator of this method Russell Ambrose, saw this post, joined bandAMP, PM'd me to first thank me then mentioned he is yet to receive any recognition. I suppose it's like changing the alphabet. I know if I was ever given the choice, it would be Ambrose tabs all the way. I like it. I might start using this method with my guitar students. they like to read guitar tab but don't like to read notation. These piano tabs are really great! Thanks for sharing them here! Hope you find useful. Despite this genius method, I resorted to learning Moonlight Sonata parrot fashion from a great YouTuber, who broke the song into about 10 parts. I've always played by ear, accept chords..
Perhaps if I was young again I'd be able to adapt to it, however sight reading was a struggle, even when I was young.